On a sweltering day in August 2008, I rushed to finish the walls of my son’s new bedroom, wiping sweat from my forehead as often as I wiped up the paint drops that spattered on the groaning wooden floor. My family was under a lot of pressure: time (only a few days before the academic year – and our new, full-time jobs – began), space (moving from our 2,400 square foot “forever home” to a smaller, older, charming cottage), and patience (we’d already moved once a couple months before, across the country into a crappy condo with gravel and glass for a front yard). Our son, Kai, was four, and impish Rory barely 16 months old. I worked all morning and into the afternoon, watching the sun rise over the eastern horizon and crest at Kai’s southern window, its heat radiating through bent, aged panes. 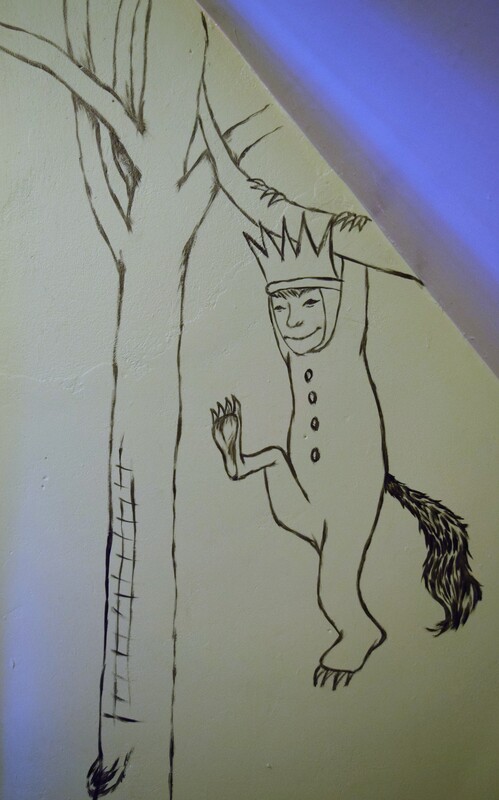 When I was done, I pulled up the painter’s tape, rinsed my brush, and started free-handing a mural that has brought many smiles to the family over the years: the boy king, Max, from Maurice Sendak’s Where the Wild Things Are, swinging in the trees with one of his wild friends. 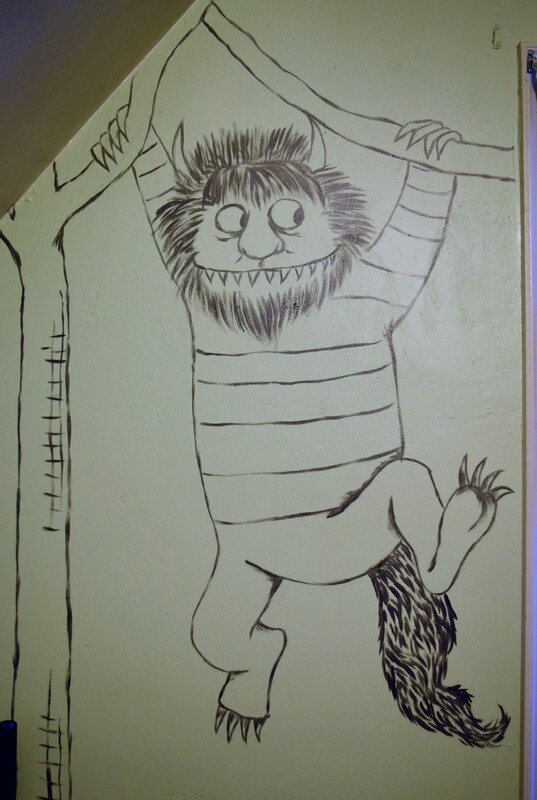 Where the Wild Things Are is a simple book with spare, economical prose and delightful illustrations. It holds a special spot in my heart, inspiring me to mischiefs “of one kind and another” and inciting countless playful rumpuses. For me, the story resonates with comfort: the knowledge that, no matter where you go or what you do, you’ll always have someone who loves you, waiting on the other side to see your face again. 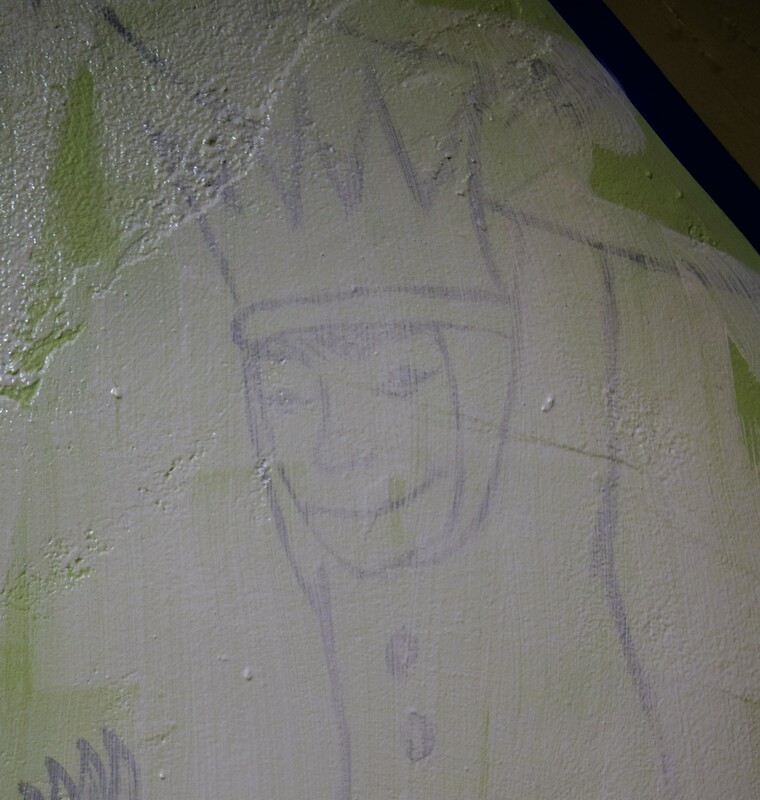 This has taken on deeper significance since I’ve lost both of my parents, but, at the time I painted the mural, I only meant for Kai to see, daily, a scene full of laughter and imagination. Together, Max and Kai have suffered colds and flus, infections, bruises, and scrapes. He’s watched Kai grow, physically and emotionally: comforting Kai through the hurt feelings of misunderstandings with friends and with us, and cheering for his academic and extracurricular victories. He silently endured the awful phase in which Kai heard only the negatives in what I said, and he taught me secret ways to navigate and strengthen a sensitive boy’s heart. I recently asked Kai to clean his room, and in the process sort through his belongings to determine if anything could be given away. Kai rose to the task, making several trips to the trashcan with loaded arms, and forming a small mountain of toys to donate. “You’re giving away your turtle?” I asked, eyeing the life-size plush toy, a once-treasured birthday gift, at the top of the mound. He looked at the turtle and back at me, saying, “That’s okay, right?” I gulped and nodded under Max’s gaze. Max stared somberly at both of us, taking in the truth: Kai’s lanky legs, wild hair, and pre-teen boy funk; the comics strewn beneath the bed; his eagerness to shed childish attachments. So, on an equally balmy day eight summers later, with time enough to recognize the gravity of farewell, Kai and I tape the perimeter of his room, haul out the primer, and say goodbye to Max, his beast friend, and the shared memories in between. We all know it’s time. Goodbye, Max. And thank you.